A low will move across central NSW with an associated trough/front bringing thunderstorm potential to areas of our region from tomorrow evening through into Wednesday afternoon. 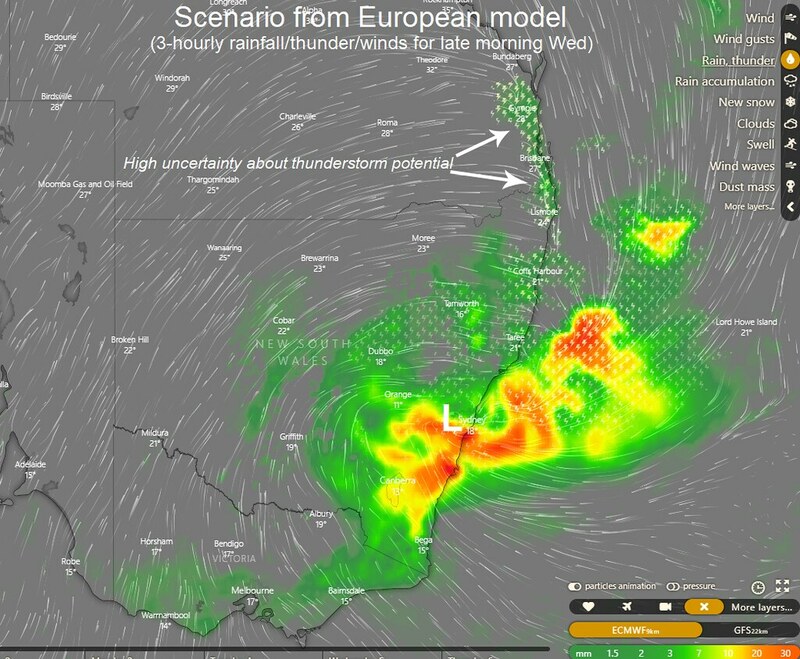 If the arrival of the dry westerlies are delayed on Wednesday, this would increase the likelihood of severe storms along the SEQLD/NENSW coast. It's looking quite borderline though. Models are differing on the timing of the westerlies and so uncertainty still persists. GFS and ACCESS-R have the dry westerlies moving in a bit earlier and therefore strongly reducing severe storm potential, while EC has the westerlies coming through slightly later with severe storms possible. There could still be the opportunity for some (most likely) non-severe storms moving through during the morning hours on Wednesday, even if the afternoon severe potential doesn't come to fruition. I think there's some limited potential overnight tonight (if that activity entering the western Downs reaches us) or Wednesday morning/very early afternoon but as per Seabreeze's excellent wording, it's a bit borderline (some patchy showers may move across overnight regardless though). - Very strong winds; even locally damaging. - Chance dust haze reaching SEQ again (but less certain than last week). Some of the modelling currently suggests the chance of some showers or patchy rain areas moving across overnight tonight or early Wed morning although the chance of thunder remains uncertain. The higher than normal uncertainty about how much thunderstorm potential there'll be is due to: 1) in this evening's case, capping and 2) in Wed's case, the slightly different timings among the models for when the very dry W to SW winds push the remaining moisture out to sea. There's also the risk of some morning cloud cover or rainfall due to the uplift of air ahead of the accompanying upper level trough approaching us. Just to use a couple of the models as examples, at time of writing this, the EC still hangs onto the moisture a little bit longer than GFS so it tries to develop a narrow zone of showers & storms whereas the GFS has the drier winds invading earlier (but it does have a tendency to sometimes be too progressive with systems). The dry'ish lower atmosphere also reduces buoyancy of rising parcels and makes the mainly huge surface-based CAPE values appearing in models like GFS look a lot higher than the actual instability. It also means that even if you do get storms, not much rainfall accumulations will result (especially since any will be moving very fast due to strong steering winds aloft). BUT if any storms do actually manage to form, they could cause damaging winds. 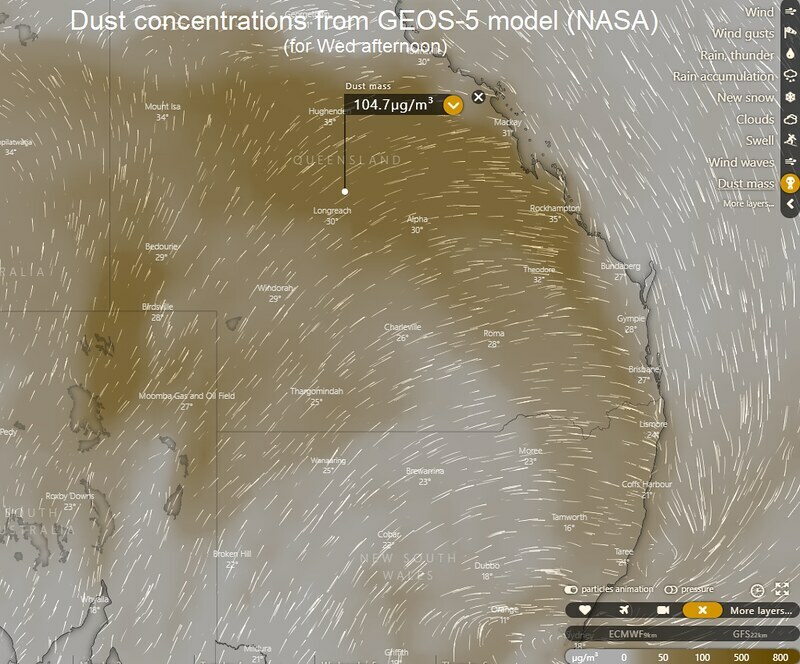 Although some dust from the interior may reach SE QLD/NE NSW again, I'd prefer to see it on the satellite imagery first on this occasion before making that call (due to the frontal boundary not being too sharp, the winds over the interior being less strong and travelling over some areas that have had recent rainfall or where the loosest dust has already been blown away). In a few of the more exposed locations, the strong winds could cause downed branches or powerlines. I think I'd rather be on the southern-central NSW coast tomorrow though near the low, flooding rain, damaging winds and even a slight tornado risk. 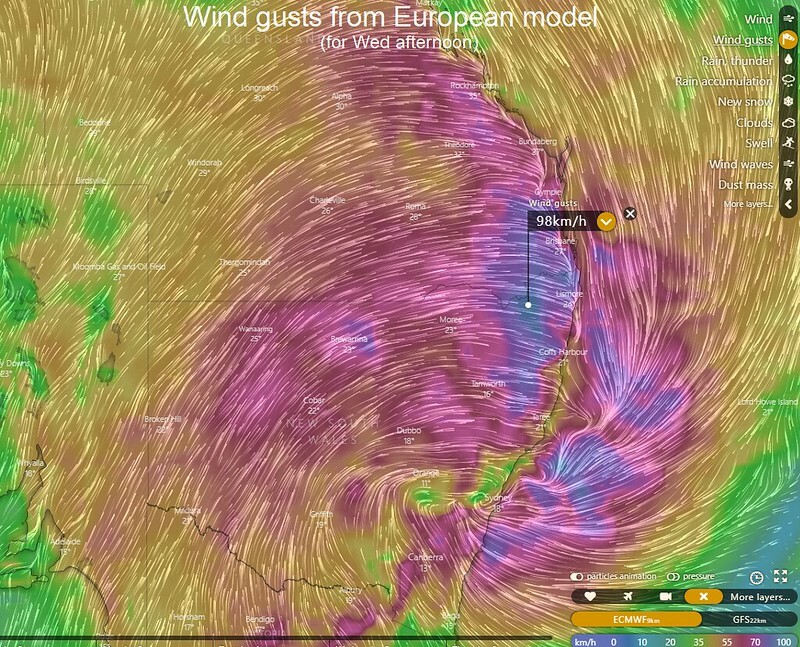 I was just reading the BOM changed the forecast for Adelaide and had the low shifted 750km further NE. Which I'd assume will be inline with GFS having the timing of the front early. Capping actually is an issue tonight but may or may not prevent the mass of storms currently marching across the Downs from making it here. Also, GFS has had a long known tendency to be too progressive (fast) with systems at longer ranges but remains to be seen whether this will be the case tomorrow. Either way, tomorrow is going to be a horrid hot windy day. Armageddon type weather Wish things would return to normal.Good weather for flies and snakes. And bushfires, terrible stuff up in wide bay/CQ Not looking forward to tomorrow, 35C+ with probably the strongest sw-lys yet. Give me humid heat any day bugger this dusty, windy desert crap. Hopefully a few mm overnight, should at least settle the dust along my driveway if nothing else! I feel like tomorrow is a huge wasted potential. Could have been a great day if that dryline held back just a few more hours. I think it would be just too wet Gleno71. All thick rainforest up there. Most of the waterfalls up there still run albeit at a lot lower levels even in the driest times. No doubt some of the open forest areas and state forest areas boarding Tamborine and surrounding Lamington would be subject to bushfires. Even parts of Mt Glorious would be a bit too much rainforest although the lower slopes and cleared valleys would be vulnerable. I think in some cases the residents bushfire plan is to evacuate up to the higher rainforest areas rather than try and drive out down through open forest areas to get out during fires. What are the chances we will see some rain overnight from the approaching system? Looks pretty on the radar but it’s all light and noise and not much rain. Some good CC’s though. A few more days coming up during the next week with some potential, but lots of problems with them too. Not really our storm season so far, but at least there's lots of action to follow around the nation. Had a shower or 2 over Bracken Ridge last night. Approx. at 2140 I had a look outside and there was dust around and the clouds looked dirty as they were lit up by the City lights etc. then we had the showers, and now to the north at 0604 and it looks dirty and hazy. From my understanding rainforest trees cannot survive bushfires. For most of SEQ ares that are dominated by Eucalyptus have been burnt in the past - otherwise rainfoest species would outgrow them, and areas with rainforest species have not burnt for as long as those trees have been alive, which for mature rainforest is centuries. It would have to be some extraordinary drought in place before rainforests around the south east would burn. Generally the ‘ fuel ‘ is too damp to maintain any fire. I grew up on a farm bordering a national park of rainforest in the northern rivers and if you were in there with a 44 gal drum of petrol you wouldn’t get anything going.